Ducati’s original Scrambler, built between 1962 and 1976, was what we might describe in today’s terms as a soft off-roader or crossover model. When the name was revived in 2015 with a carefully cultivated go-anywhere image, it was more road oriented. 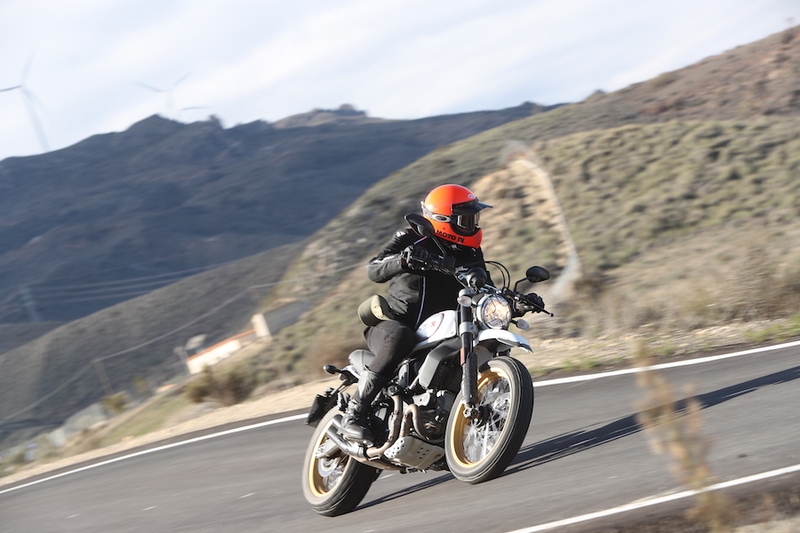 And while Ducati did dip a 21st-century toe into the Scrambler’s dirt heritage with its wire-wheel and high-mudguard-fitted Urban Enduro, this was purely a bodywork styling exercise. 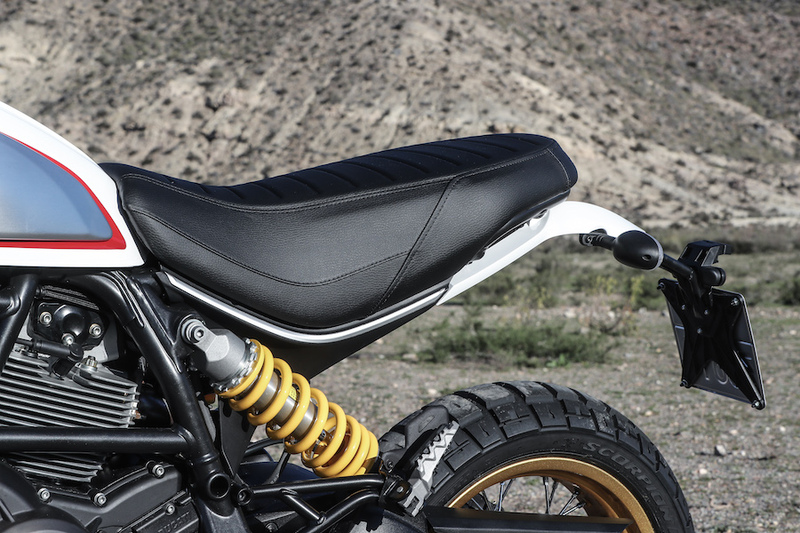 Ducati’s new Scrambler Desert Sled is a genuine dirt-based ride. It takes its name from the off-road machines that first appeared on the sands of South-West California and in Mexico’s Baja desert back in the 1950s. The original Desert Sleds were stripped down roadbikes built for off-road desert racing; the new craze reached such heights that Ducati introduced its original Scrambler range, and even had a brief dabble in the world of motocross with its 450 RT Desmo. As we know, the 21st-century Scrambler isn’t just a Ducati model, it’s a whole brand within the brand, and a bloody big one. It’s marketed as a lifestyle with its own Land of Joy philosophy, dress code and even a radio station. And the launch of the Desert Sled to a group of international bike journalists was another display of bigger than Ben Hur PR. After being collected from our hotel in the cold and dark early hours of a Spanish morning, we were whisked away to the Tabernas Desert located outside Almería in the country’s south. Our destination was Fort Bravo Texas Hollywood, a Western-styled theme park used as the film set for a host of sixties spaghetti westerns including The Good, the Bad, and the Ugly. The surrounding desert landscape was equally as impressive – what better way to test a model inspired by off-road racers born in the deserts of America than to ride out into Spain’s own Wild West Badlands? As we moseyed down the dirt main street of Texas Hollywood, the only 21st-century sight was 30 new Ducati Desert Sled motorcycles sitting outside the swinging doors of the town’s saloon. As you approach the Sled, the signature teardrop-shaped tank means there’s no mistaking it as a Ducati Scrambler. Then you spot the higher stance, belly bashplate and cage protecting the LED headlight and you begin think that this may be a diffirent beast. But it’s when you get closer that you realise this new bike is much more than a naming and styling exercise. The frame has been substantially reinforced around the swingarm and footpeg area at the rear of the trellis frame. 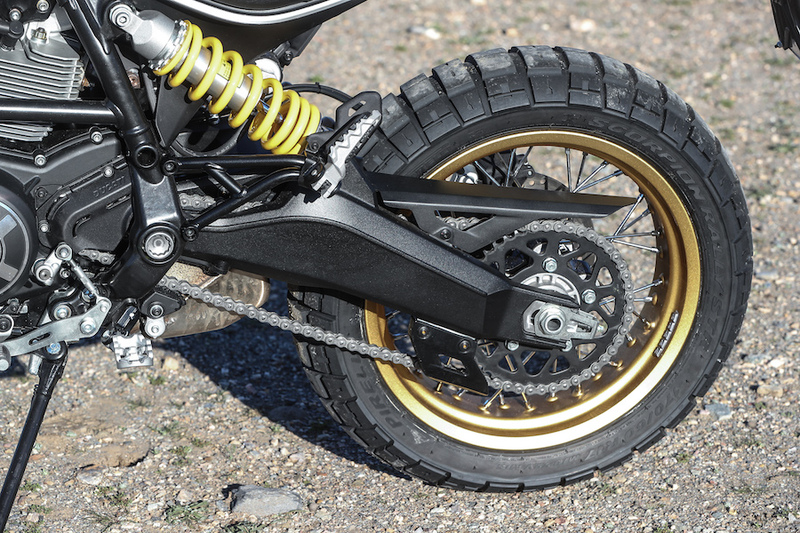 Steel plates have been added on either side and incorporate the rear engine mount, swingarm pivot point and footpegs, which sit lower and further forward than the Scrambler. These plates also hug the engine and are designed to absorb and distribute stress. The reinforced aluminium swingarm is new too. 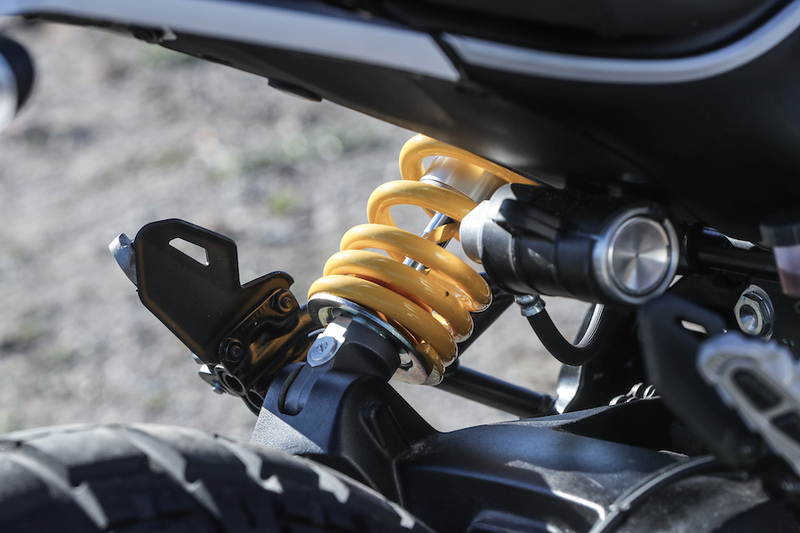 As well as being longer, it’s much straighter than the ‘banana’ unit fitted to the rest of the Scrambler family. If the press kit shots of a Desert Sled getting a serious amount of air are a ‘serving suggestion’, these are the changes Ducati needed to make. You can’t help but agree that it looks a bit like a classic chook chaser – but when was the last time you spotted a trail bike with a V-twin stuffed into it? The wheels have been a hot topic of discussion since the bike was unveiled at EICMA last year. Finished in gold, and fitted to the all-white (White Mirage) Desert Sled, they’ve drawn plenty of comparisons with Yamaha’s classic XT500. 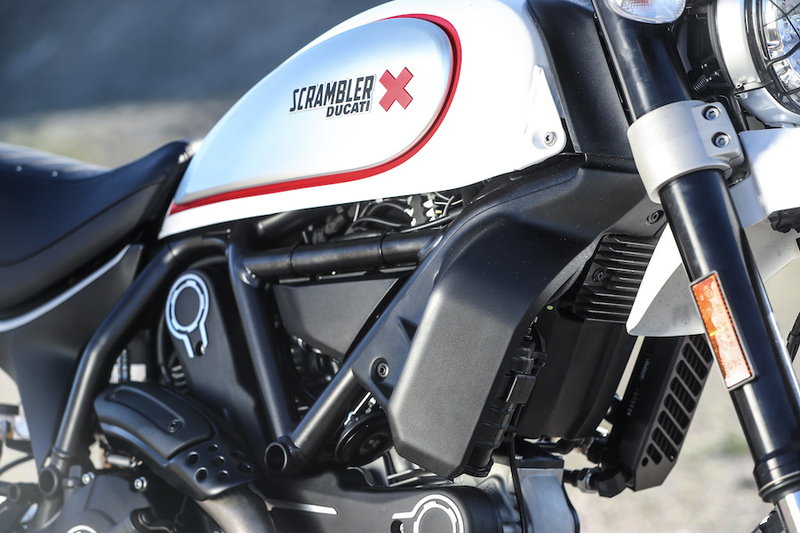 But when quizzed, Ducati’s Scrambler Project Leader Antonio Zandi assured me that any similarities were purely coincidental and that white with gold wheels was chosen simply because “it looks good”. Another interesting styling decisions made by the Scrambler team has been to retain the low-slung exhaust system instead of attempting the now almost obligatory leg-burning high-mounted unit. Kudos to Ducati for bucking the trend. Not only would it have looked as ugly as a hatful of buttholes, the Sled’s 240mm of ground clearance, combined with the twin pipes being neatly tucked away, means there’s almost no chance of ever scraping the pipes or the twin end cans on anything – unless you are well on your way to crashing. The test bikes had also been fitted with a pair of decently sized metal footpegs, replacing the rubber-inserted units that also come as standard with the Multistrada – another indication of what lay ahead on the test. Following the highly entertaining technical session (presented as a gunslinger saloon game of poker), it was time to organise our posse, saddle up and get out of town on our mechanical steeds. With the obligatory 30-second familiarisation session over, and an extra 30 seconds afforded to come to grips with the soft sand we would be riding through for most of the day, it was time to pick up the pace and move to the front or spend a day eating dust at the back of the herd. 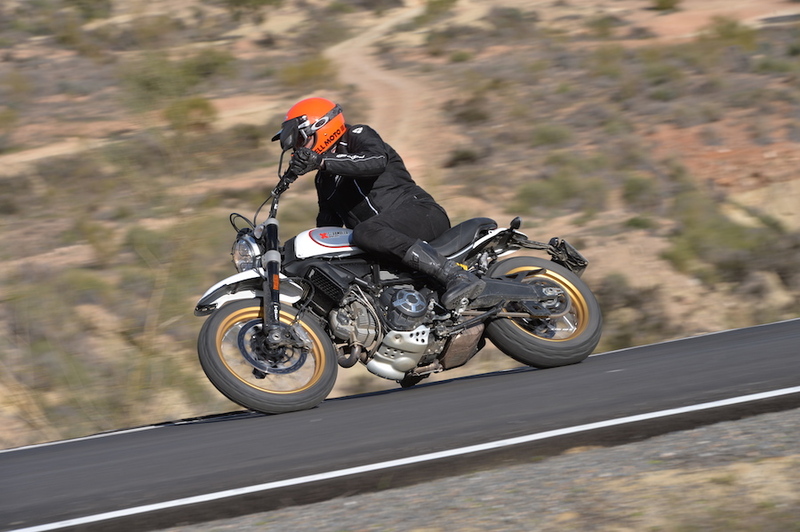 Where the launch of the original Scrambler was a brand and lifestyle exercise, the Desert Sled launch turned out to be a good old-fashioned thrashathon. The air-cooled 803cc V-twin engine may be mechanically identical to the unit used in the rest of the Scrambler range, but the power delivery is entirely new. This all comes down to forward thinking by Ducati engineers who built Euro 4 compliance into the engine from the start. The only changes required for the power unit to be 2017 ready was a new evap canister and a larger cat on the exhaust system. 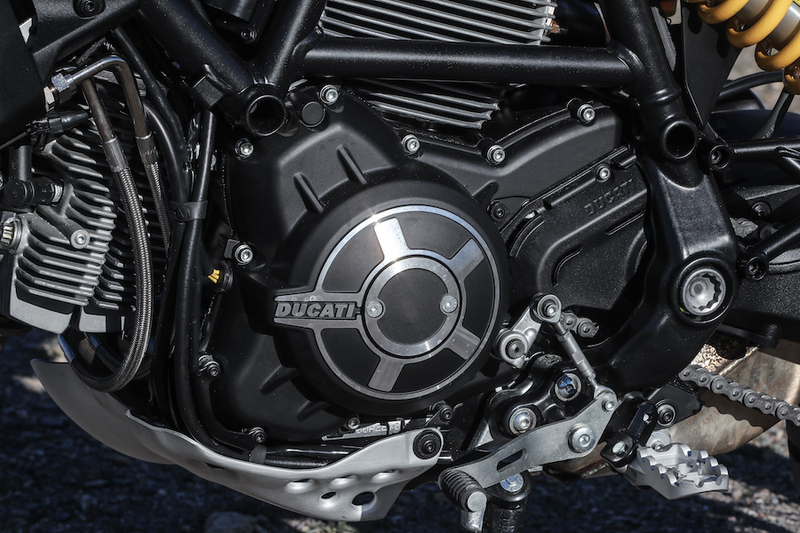 Ducati claims unchanged power and torque figures of 55kW @ 8250rpm and 68Nm @ 7750rpm. The change I could feel in the power delivery was from the new ride-by-wire software in the unchanged ECU. The Sled has a more progressive throttle opening, doing away with the 1:1 throttle input/butterfly opening of the Scrambler Icon. When you rotate the throttle 10 degrees on the Desert Sled the throttle opens just five degrees. This changes gradually until it becomes a 1:1 ratio at around the 40 per cent throttle point. The result is a bike which may have lost a touch of its bottom-end punch but is much easier to manage at low speed on the dirt and on the road. There’s still plenty to play with, and the bike will easily powerslide the rear wheel sideways on command. Thankfully, these changes have had next to no effect on the engine’s trademark throaty V-twin sound. The higher and wider motocross-style handlebar provides the Desert Sled with a different handling feel to its brethren. The 95mm of additional handlebar width feels great when you’re standing on the ’pegs, but does require a little getting used to on the road due to the additional reach required when steering with your hands spread so wide apart. The switchable Bosch ABS is carried over from the existing Scrambler range and is my big sticking point with the Desert Sled. While the system remembers your setting when you turn off the ignition, turning the ABS on and off is a little too fiddly for a bike marketed as a real scrambler. A stationary bike and multiple press, hold and menu scrolls on the left-hand switchblock are required each time you wish to activate or deactivate the ABS. This makes the transition from tar to dirt and back again a lot less fluid than it would be with a single-press-and-hold ABS control button on the switchblock. I eventually left the ABS deactivated full time, which never caused an issue thanks to the excellent feel from the four-pot caliper Brembo braking system. All important information is displayed on the LCD retro-style single-pod gauge. The digital engine speed display, which runs around the bottom of the dial, was a little hard to read once I had a coating of dust on my googles, but that’s just an old person’s complaint. And who’s interested in an engine revs display anyway, when you have two perfectly good ears, and two eyes firmly fixed on the trail ahead? Recent heavy rain across the region had turned parts of the gravel, shale and sand-covered dirt tracks into steep rut-infested minefields. If the Desert Sled wasn’t up for a bit of rough stuff, this ride was going to expose any weaknesses. The altered riding position brought about by the higher and wider handlebar, higher seat (860mm) and slightly lower footpegs makes stand-up riding a cinch, and as soon as the graded dirt and gravel road petered out it was time to stand up and go with the flow. Being 192cm tall does have its challenges when riding up on the ’pegs, however. I usually find myself bending heavily at the knees to lower my centre of gravity, which leads to bloody sore quadriceps at ride’s end. But despite its size, the Sled feels like it has been designed for beanpoles like myself and (maybe no coincidence) Project Leader Antonio Zandi. When I did take a seat, it was almost as if the bike was inviting me to stand again – usually, it’s the other way around. My size 11 hoofers in adventure boots found the footbrake lever position a little high, making it difficult to ride standing with my toes covering the brake lever. Bumps caused me to engage the rear brake accidentally. An adjustable footbrake similar to those used on many adventure bikes would have been a nice extra touch. Despite having 50mm of additional suspension travel and a 19-inch front wheel, the sweet handling chassis geometry of 24 degrees of rake and 112mm of trail was purposely retained when the new stiffer triple clamps for the 46mm fork legs were designed. Traversing loose sand on the Desert Sled is simply a case of shifting your weight back, and powering through. You need to let the bike move a little because the 120/70 Scorpion Rally STR tyre up front won’t cut through the lose surface like narrow dirtbike hoop. However, if you are a soft-surface riding novice, the Sled will instil confidence quickly. The upgrades and additional reinforcing required for off-road use has led to a 21kg dry weight increase (170kg to 191kg) but the extra bulk is not noticeable on the dirt. Thankfully, I wasn’t forced to pick it up off the ground at any time, so I’m happy not to report on the ease or otherwise of lifting an approximately 207kg (wet) motorcycle. 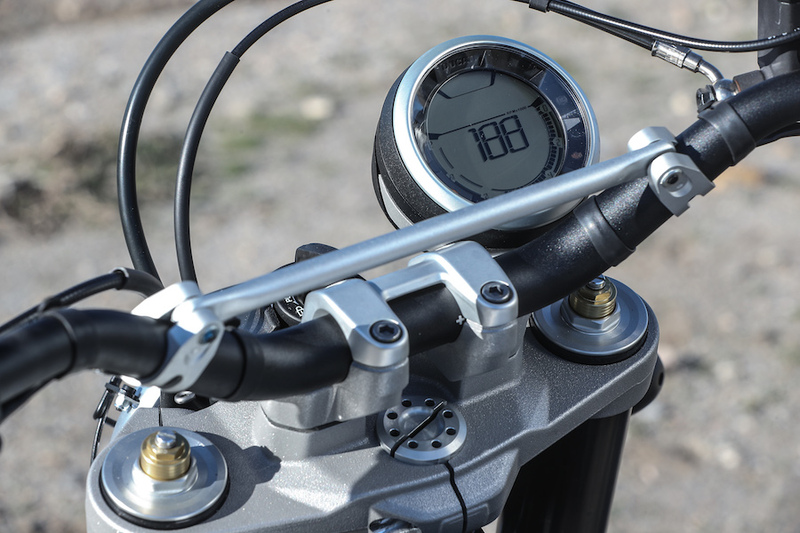 As with all other Scrambler models, the gearbox is a joy, with clutchless up and down shifts possible on the move. The gear ratios remain the same as the existing Scrambler, which can leave it a little confused in tricky dirt sections as you are forced to choose between wheel-spinning first gear or slightly boggy second gear. Closer ratios between the most used first three gears may be the answer. The new suspension package wasn’t troubled at any time during the ride despite crashing through and over a number of large ruts and rocks, as well as a couple of jumps. The Kayaba kit offers a firm but comfortable ride right through its stroke, without a hint of sloppiness at the top, and doesn’t compress to rock hard towards the bottom. I watched on (and maybe also chuckled) as former MCN editor Marc Potter crashed through one of the biggest ruts on the ride. But an inspection of the suspension indicated that neither the front or rear suspension had bottomed out. Even when the Sled had to work under my heavy frame there were no bangs, clunks or complaints from the chassis. Everything felt solid – an impressive result when you consider the bike is based on a road-oriented model. Riding at higher speeds on tar, the wide motocross handlebar, high seating position and firm long-travel suspension gives the bike a motard feel – minus the torquey punch of a single-cylinder engine. This is a bike that does its best to release your inner hoon. Other than straight sections where the Sled sat comfortably on 100km/h at 4500rpm, most of our road riding was done through tight second and third-gear twists. This made it difficult to gauge the high-speed cornering performance of the suspension and the Pirelli Scorpion tyres, but some ’peg scraping antics revealed solid handling, and that the tyres have a nice bit of edge grip. 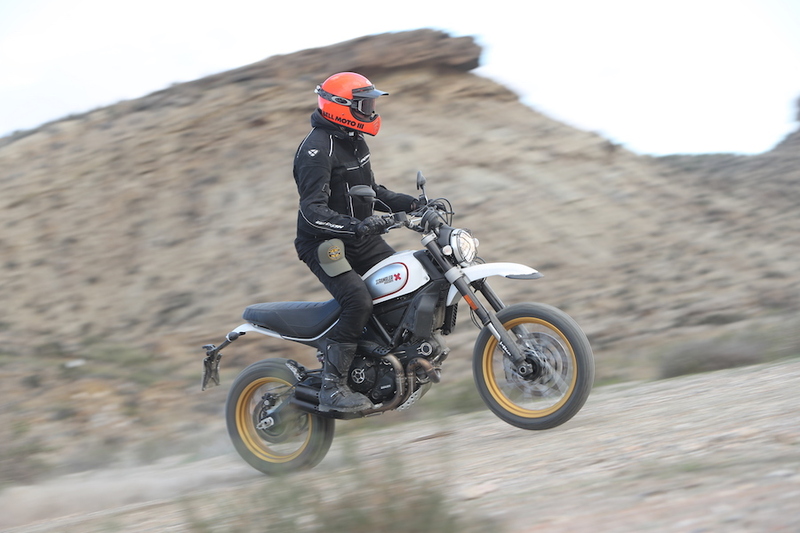 In no way am I attempting to pass the Desert Sled off as a serious enduro dirtbike – the 19-inch front wheel, and wider dual-purpose tyres are an indication of that. You wouldn’t thrash it around a motocross track, and it won’t perform like a WR450 along the trails. Its 13.5-litre fuel capacity means you’re not going to cross the Simpson Desert on it either. But in a lot of ways these are good points, because one thing this bike is not, is intimidating for riders who may find a full-blooded adventure bike a bit too big. This point alone sets it aside from most players in the adventure market. As well as being a true scrambler, it’s also an attractive alternative to a soft off-road adventure bike for those looking to take the off-road long way home, and have a bucket load of fun doing it. It also looks set to be a winner with experienced riders who want to hit the fire trails with their adventure-bike-mounted mates. Despite the launch shenanigans proving the Sled’s dirt credentials, some buyers may never take their Scrambler off-road and simply use it as a good-looking daily commuter, and that’s more than understandable given its retro enduro-bike style. It doesn’t feel out of place on the road – and certainly doesn’t look it. Most of us purchase a little outside the square, not because of what we plan to do, but because it’s good to know what our bike can do, and you want to be ready when the urge to go bush strikes. The Desert Sled is expected to arrive on Australian shores in late June. Pricing has already been confirmed as $16,990 (Red Dusk) and $17,290 (White Mirage), which makes it $3700 more expensive than the base model Scrambler Icon ($13,290), but it takes all of 10 seconds to see where your additional investment is going. The Scramble is well and truly back in the Scrambler. The 19-Inch front and 17-inch rear wire-spoked wheels replace the 18-inch and 17-inch cast aluminium and steel units found on the current Scrambler models. 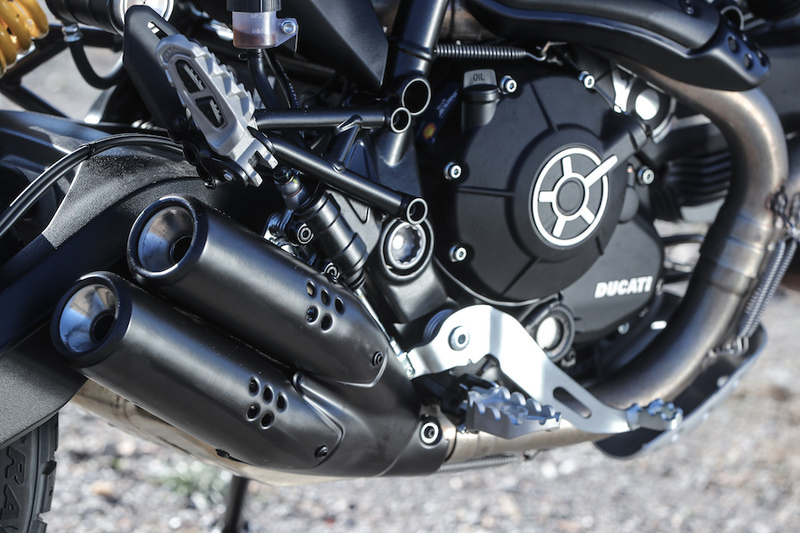 During the bike’s development, Ducati tested an 18-inch, 19-inch, and even a 21-inch front wheel. The 18-inch was not an option, and the 21-inch front wheel matched to a 17-inch rear simply looked like a big wheel with a bike attached. The new Pirelli Scorpion Rally STR tyres (120/70 front 170/60 rear) have been specifically designed by Pirelli for the Desert Sled. The tread pattern offers an excellent mixture of on- and off-road capabilities with a slight bias towards the dirt. Don’t expect the grip of a motorcross-style knobby, but they won’t squirm all over the road either. As a crossover tyre, they are an impressive OEM fitted hoop. The frame is reinforced around the swingarm pivot point with additional bracing to assist with distributing forces when tackling rough terrain, rather than having them concentrated into the rear engine mount. The footpegs have also been beefed up for fancier off-road footwork. If you’re looking to spend decent amounts of time in the dirt, you might want to consider the larger footpegs from the accessories catalogue. A fully adjustable 46mm Kayaba USD fork replaces the non-adjustable 41mm unit on the existing Scrambler. 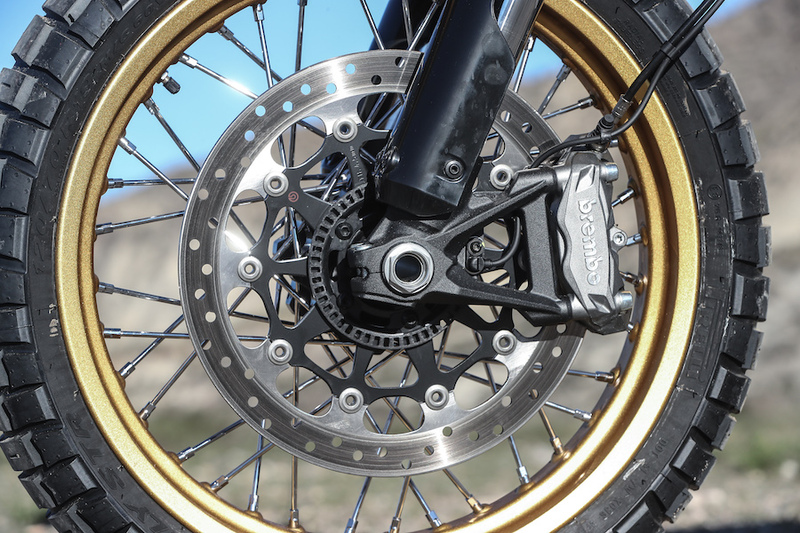 A wider inner-fork clearance makes room for the wide front tyre. The new aluminium shock, with separate gas reservoir is adjustable for preload and rebound. There’s also 50mm more wheel travel – a total of 200mm at each end. That’s 10mm more than a BMW R1200GS. The 803cc engine may be one of the last Ducati air-cooled V-twins, but it makes perfect sense on the Desert Sled. Not having a radiator means there’s no chance of a flying rock causing a puncture – and leaving you watching on while precious coolant leaks out into the dry desert sand. The mid-capacity V-twin engine is also now Euro 4 compliant, so you can expect it to hang around for a little while longer.